Category Archives: Is prasadam your karma phalum? Is prasadam your karma phalam? It is! Here is why. The fruit that you offer yourself to god, you receive it in the form of praasad, that is to me Karma phalum. Praasad means three things: Mercy of God, favor — blessings of the God, and satisfaction (Vedabase.net). So you are at the mercy of god when you offer your fruit and he blesses you with what you put there infront of him/her and in turn sees you take it gracefully and be satisfied. 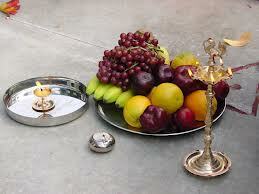 This is how prasadam works, what you place for God and receive. Taking the praasad with you, offering the praasad, being satisfied by it and importantly seeing it take into effect in your life, those results are — phalithum. phalitham means – you are satisfied with the blessings of God, you have obtained the fruitive results from God. The fruitive results does not mean just monetary gains but it also means gains in spiritual and personal growth. It is our karma phalitham.